CHELSEA MAY BE unbeaten in their last eight meetings with Liverpool (4 wins, 4 draws), but Blues boss Jose Mourinho is going through something of a crisis right now. Having lost out to West Ham last weekend, the reigning Premier League champions also went crashing out of the Capital One Cup in midweek — going down to Stoke City on penalties after a 1-1 draw. Meanwhile, Jurgen Klopp has just picked up his first win as Liverpool manager and the German’s record against Mourinho isn’t bad. He has two wins, one draw and one defeat from four meetings during their spells at Borussia Dortmund and Real Madrid. Two clubs punching above their weight, third-placed West Ham and fifth-placed Leicester City, are both on the road this weekend. Under Slaven Bilic, the Hammers have already claimed wins at the Etihad, Anfield and the Emirates, and they could potentially go top of the table if they can get the better of Watford at Vicarage Road. Similarly, Leicester new manager Claudio Ranieri has settled into life at the club remarkably well and the Italian treated his players to pizza during the week after they kept their first clean sheet of the season in the victory over Crystal Palace. West Brom come into the game on the back of two wins, but with top scorer Jamie Vardy in the form of his life, the Foxes should have enough at The Hawthorns. He may be going through some contract issues with Stoke City at the moment, but that hasn’t stopped Jon Walters giving everything on the pitch this season. One of Ireland’s most consistent performers in the Euro 2016 qualifiers, the big forward will be full of confidence after his brilliant goal in the Capital One Cup win over Chelsea on Tuesday. He picked up a dead leg that night but is fit to play Stoke on Saturday and could well add another goal to his tally against the Magpies’ leaky defence. Both knocked out of the Capital One Cup during the week, Manchester United and Arsenal face into away fixtures on Saturday. Louis van Gaal’s men couldn’t score against Middlesbrough in 120 minutes of football and captain Wayne Rooney, who missed his penalty kick in the shootout, was on the receiving end of some criticism after another under-par performance. They’re up against a Crystal Palace side who are back in seventh after defeats in their past two games. The Gunners, meanwhile, are at the Liberty Stadium to take on Swansea, who did the double over them last season. The Premier League leaders are the club who have scored the most goals in the league this season (24) and they put five past Palace in the league cup a few days ago. City boss Manuel Pellegrini can call upon influtential playmaker David Silva again after his return to fitness, while recent big money signing Kevin de Bruyne has been superb since his arrival from Wolfsburg. Norwich, on the other hand, have lost their last three matches and Newcastle hit them for six a fortnight ago. 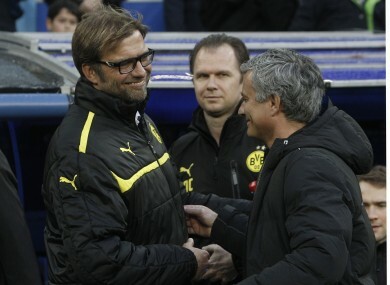 Email “Klopp to pour more misery on Mourinho and the Premier League bets to consider this weekend ”. Feedback on “Klopp to pour more misery on Mourinho and the Premier League bets to consider this weekend ”.